environment and, in turn, successfully improve human health. They call for prevention and precaution as the first line of action. They seek to heal the tragic split that conventional medicine made from nature and to conjure nature's own mysterious capacity for self-repair. 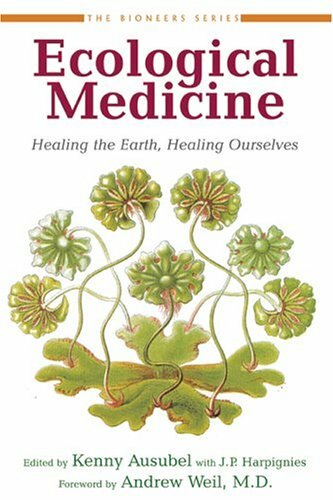 They celebrate the virtues of ancient natural-medicine practices but also embrace an integrative medicine that uses the best of all approaches to healing--with special emphasis on the centrality of the human spirit in the healing process. Their inspiring work, described so compellingly in this book, is of critical relevance to everyone concerned about health and the environment. ABOUT THE BIONEERS BOOKS: Since 1990, the annual Bioneers Conference has gathered scientific and social innovators who have demonstrated model practices and practical models for restoring the Earth. The Bioneers come from many diverse cultures and perspectives, and from all walks of life. They are scientists and artists, gardeners and economists, activists and public servants, architects and ecologists, farmers and journalists, priests and shamans, policy makers and everyday people committed to preserving and supporting the future of life on Earth. Uniting nature, culture, and spirit, their visionary and practical solutions also embody a change of heart, a spiritual connection with the fullness of all life, grounded in social justice. Dr. Andrew Weil, Dr. Andrew Weil graduated from Harvard University. He has taught at the University of Arizona in Tucson, specializing in alternative medicine, medical botany and mind/body interactions. He is the founder of the Program in Integrative Medicine at the University of Arizona Health Services. Dr. Weil is the author of several books which includes the titles "The Natural Mind" (1972), "From Chocolate to Morphine" (with Winifred Rosen, 1983), "Natural Health, Natural Medicine" (1990), "Spontaneous Healing" (1995), and "Eating Well for Optimum Health: The Essential Guide to Food, Diet, and Nutrition" (2000).